Sorting through the information in USP <800> is overwhelming and confusing, and it can be difficult to know where to start. Compliance with USP <800> may seem like a Herculean task, but it can be done and is an important step in ensuring employee safety. It has long been known that handling of hazardous drugs (HDs) in any health care environment including veterinary clinics can have serious consequences for personnel who handle these drugs. Hazardous drugs have been linked to short-term side effects such as sore throat, chronic cough, infection, dizziness, eye irritation and headaches as well as long-term side effects such as cardiac and renal damage and the development of cancer. In addition to these side effects, there is also the potential for infertility, fetal loss and fetal abnormalities. It is important that employees involved in the handling of hazardous drugs understand the risks that these drugs pose and what precautions to take to avoid exposure. In the past, there have been recommended guidelines for the handling of hazardous drugs, but there have been no enforceable legal standards in most states. Several states such as Washington, North Carolina and California have already published regulations that standardize the handling of hazardous drugs, which are legally enforceable. Expected to become official on December 1, 2019, USP Chapter <800> Hazardous Drugs – Handling in the Healthcare Setting (www.usp.org) will then become enforceable federal standards that must be followed in all healthcare facilities, including veterinary facilities. At the present time, it is not known exactly how these standards will be enforced and what the potential consequences of non-compliance will be, but it is important to be aware of the regulations and follow the recommendations to ensure employee safety. What Classifies as a Hazardous Drug? Be a new drug that is similar to drugs that already exist on the list. Group 3: Drugs that primarily pose a reproductive risk to men and women or to women who are pregnant or breast feeding. (i.e. alitretinoin, clonazepam, colchicine, fluconazole, misoprostol, oxytocin, pamidronate, valproic acid, warfarin, zoledronic acid and zonisamide). Who is at risk and what is the risk of exposure? Routes of exposure can include absorption through the skin or mucous membranes, inhalation, ingestion and needle sticks. The risk of exposure in part depends on the duties of the employee but can occur at any point in the “lifecycle” of a HD in a facility. All types of employees can be exposed including veterinarians, technicians, front office staff, kennel workers and custodial staff. It is important to consider all points at which employees can be exposed including: receiving and unpacking HDs; placing HDs into inventory; compounding, dispensing or administering HDs; during patient care; during handling of spills and disposal of waste, whether it be cleaning of urine, feces or vomitus; washing of contaminated bedding; or packaging of contaminated medical waste. Staff who are not typically involved in the handling of HDs can be exposed by coming in contact with surfaces that are contaminated due to improper handling. How will HDs need to be handled? There is no level of exposure to HDs that is considered to be safe. In order to reduce the risk of exposure to these drugs and ensure safe handling, a hierarchy of controls will be required. This can include the designation of specific areas of the facility for where HDs are stored and used, the use of appropriate engineering controls when required, the use of appropriate personal protective equipment, clearly defined policies and procedures, and staff training with competency demonstration. Engineering controls are considered to be physical barriers that prevent exposure to HDs. This includes both the design of the facility and equipment that provides protection from exposure: the designation of restricted access areas for the receipt, unpacking and storages of HDs; negative pressure rooms for handling drugs that are more volatile; and ventilated devices such as chemotherapy hoods and closed system transfer devices. A closed system transfer device is defined as a drug system transfer device that mechanically prohibits the transfer of environmental contaminants into the system and the escape of HDs, or vapor concentrations, outside of the system. 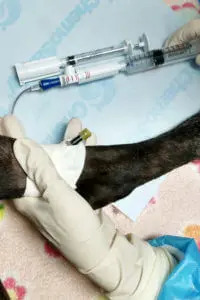 There are a number of these systems available on the market with PhaSeal™ and Equashield® being two of the most commonly used systems in veterinary medicine. Personal protective equipment or PPE is designed to protect employees from exposure to hazardous drugs. The type of PPE that is required depends on the specific task and risk of exposure. Types of PPE that are used in the handling of HDs include chemotherapy gloves, chemotherapy gowns, goggles, face shields, respiratory protection (fit tested NIOSH approved N95 mask or chemical cartridge respirator), hair and beard covers and shoe covers. The NIOSH List of Antineoplastic and Other Hazardous Drugs in Healthcare Settings lists the type of personal protective equipment and engineering controls that are required for specific tasks as well as outlines the required standards for each type of PPE (www.cdc.gov/niosh/topics/hazdrug). Not all drugs that are defined as hazardous may pose a significant risk of occupational exposure because of the dosage formulation. The requirements for handling of HDs will depend on the group classification of the HD as well as the dosage formulation (i.e. tablets, suspensions, injectables). 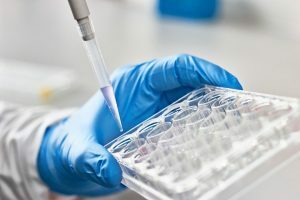 There will be inherently more risk when working with certain drugs such as injectable chemotherapy agents as compared to dispensing drugs that are already in their final form. There should be designated areas for the receipt, storage, dispensing and administration of HDs as well as for storage of contaminated waste prior to disposal. All containers of HDs must be labelled, tagged or marked as such. For those veterinarians that work with Group 1 drugs, a significant investment in a facility redesign and additional equipment will be needed unless the drugs are being dispensed in their final form and there is no risk of aerolization due to particles or dust from the drugs. Working with Group 1 drugs will require a dedicated room that is under negative pressure and a ventilated device (i.e. chemotherapy hood). Ultimately, each veterinary facility will need to decide whether or not it is worth making the investment required to use these drugs. Every facility must complete an assessment of risk for all drugs and dosage forms they use that are on the NIOSH list. And they must determine what appropriate handling and containment strategies are necessary for each of the drugs. If a facility chooses not to perform an assessment of risk for each drug, then it must handle all of the drugs on the list according to the strictest policies. 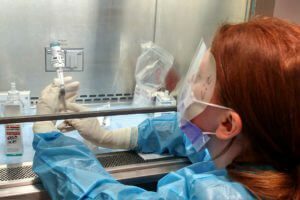 Most veterinarians will only be involved in handling Group 2 or Group 3 drugs, which means that they can be handled by alternative containment strategies and will not require a significant investment in equipment and redesign of the facility. Alternative handling strategies can include the following: labeled storage areas and/or separate storage areas for HDs, posting what PPE is required to handle each of the drugs, use of chemotherapy gloves for drugs that are not antineoplastics, use of dedicated tools and equipment to handle HDs and the use of closed system transfer devices for injectable HDs that are not antineoplastics (i.e. injectable apomorphine). Other options would be to purchase drugs in unit-dose or unit-of-use so that compounding or manipulation is not necessary, and to have prescriptions of HDs filled by outside pharmacies. A key part of ensuring safe handling of HDs is the training and education of the staff and the use of appropriate PPE. All employees who will be required to handle HDs must receive the appropriate training PRIOR to working with these drugs. The type of training is determined by what specific duties they will be performing. Not only must employees be trained, they must also be evaluated for competency, and both the training and the competency needs to be documented. Training must include the following: an overview of the list of HDs and risks, review of all SOPs regarding handling of HDs, instruction of the proper use of PPE, instruction on the proper use of equipment and CSTD devices, what the appropriate response to known or suspected HD exposure is, spill management, and proper disposal of HDs and trace contaminated materials. In addition, all staff capable of reproduction must acknowledge in writing that they understand the risk of working with HDs. Along with all of the other requirements for USP <800> comes the need for documentation and the development of standard operating procedures for the safe handling of HDs in any situation that may be encountered in the facility (i.e. dispensing of HDs, what to do if there is a spill, how to dispose of contaminated waste). This includes the development of a hazard communication program, development of a list of all HDs used within a facility, providing safety data sheets for these HDs, development of policies and procedures to ensure worker safety during hazardous drug handling, documentation of employee training and competency assessment, and documentation of maintenance of the facility and equipment. Start with obtaining a copy of both USP <800> and the NIOSH list of HDs. Every facility should have a designated person responsible for developing and overseeing a hazardous drug safety program, so establish who that will be. This person should make a list of all of the drugs used in the facility that are potential HDs and make an assessment of risk for each drug and dosage formulation to help determine handling requirements and appropriate PPE. He or she should perform what is called a gap analysis, which involves determining how you are handling the drugs now and what needs to be changed in order to comply with the regulations. There are also outside resources that can help you determine actions required for your facility. Make sure that you work with companies and vendors that are knowledgeable, and if you need any redesign of your facility, use a contractor or architect that is familiar with the requirements. There are already companies that do OSHA training for veterinary hospitals, and they will be able to advise you and put together a HD program for your facility. You can find resources online, including courses that can be taken through USP and guidance documents for human facilities. The AVMA is actively involved in putting together guidance documents for veterinarians, and these should become available in the near future. It is important to start moving towards compliance now and not wait until USP <800> becomes enforceable. Kienzle P. The Chapter <800> Answer Book. ASHP Publications 2017. Consensus Statement on the Handling of Hazardous Drugs Per USP <800>. March 2017. Facility and Engineering Controls Using USP 800 Guidelines. Prince, Bryan. OSHA. Controlling occupational exposure to Hazardous drugs. www.OSHA.gov. OSHA. Hazard Communication. Small Entity Compliance Guide for Employers that Use Hazardous Chemicals. OSHA 3695-03;2014. NIOSH Alert: Preventing Occupational Exposure to AntiNeoplastic and Other Hazardous Drugs in Health Care Settings. Publication No. 2004-165.